A lot has happened since the last time I posted a blog entry. I do apologize, with the birth of my son Griffin in December and my final semester of college, time has been hard to come by, but let’s get you caught up. On February 21st we hosted a Try Sled Hockey Day that had more than 75 participants. Our event was held to celebrate the $25,000 grant we received from Labatt Blue’s Pass It Forward initiative and also to raise awareness about our sport. 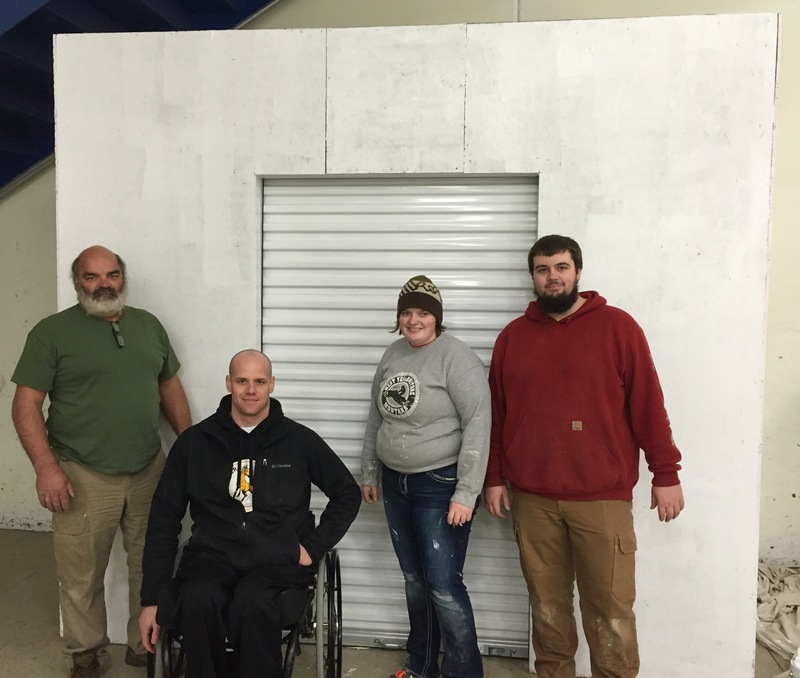 The ultimate goal of allowing both able-bodied and disabled individuals try sled hockey was to gain more players. We now have more than 10 roster spots available as a result of our grant money and are actively seeking players to fill those spots. Even KTTC’s Taj Simmons and Devin Bartolotta hopped in a sled and gave it a try. 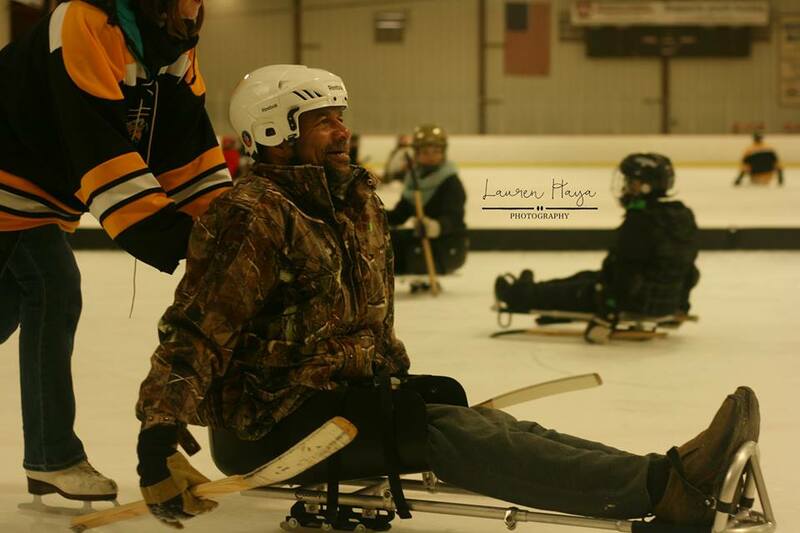 As a result of our Try Sled Hockey Day we gained a few new players, although we would have considered our event a success even if we only had one new player join. Our new player Jerry, who has muscular dystrophy, also got to share a special moment with his children when he got on the ice to skate with them for the first time. The Mustangs have become much more than a sports team in the past year. When you join the Mustangs you not only join a competitive team that is driven to succeed, but you also join a growing group of friends who support and push one-another to defy the stigma of disability and share special moments that might not otherwise be possible. It has become hard to tell who enjoys being a Mustang more lately, the volunteers or the players. 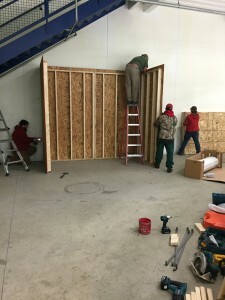 Not enough can be said about the growing number of volunteers we have and their dedication to provide all abilities the opportunity to play hockey. Volunteers are crucial to our programs success at every level. Thanks to the hard work from our very own Rob Weigel and help from Oakwood Construction, we now have proper storage for all of our gear at Graham Arena. Graham Arena has been very accommodating with our program as we grow and learn to operate more efficiently. With our new storage, we look to have scheduled open skate times where both able-bodied and disabled individuals can join us on the ice. Confidence is at an all time high for the Mustang program. Our short-term goal is to grow the size of our program and test our skills by scheduling some scrimmages to end our first season. But those are easily achievable goals, and the Mustangs want to go bigger. Our long-term goal is to get rink modifications that would make the benches convertible to handicap/sled accessible and then host regional sled hockey tournaments. 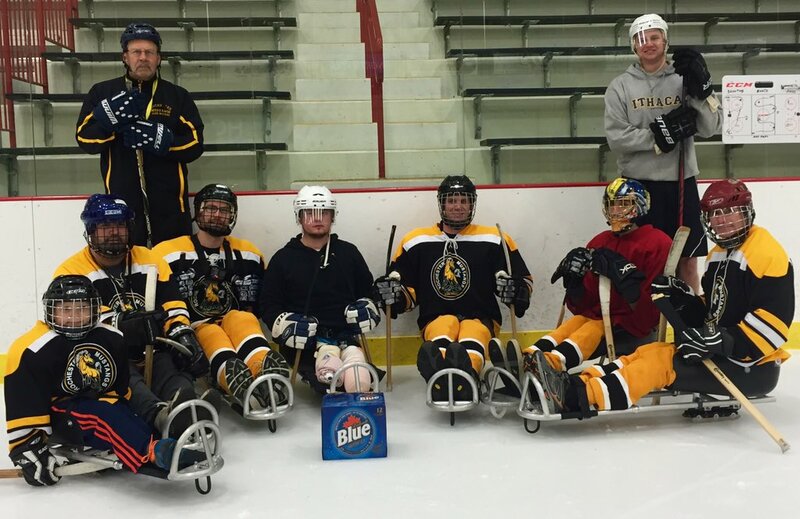 We live in Med City, so why not make Rochester a hub for disabled hockey and sports? As always, we continue our strive to grow the Mustangs program and recruit more players. 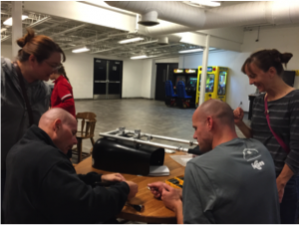 If you know of anyone who may benefit from joining an adaptive sport and a great group of supportive individuals, please help share our story. Justin McClanahan is Public Relations major at Winona State University. Justin is a player and board member for the Rochester Mustangs. With everyone frantically trying to get their Christmas shopping done, or started, it is important to take a moment and remember what we are thankful for. It is hard to believe that the Mustangs are about a year old already, and what a year it has been. We would like to reflect on some of the things that we are thankful for as 2015 is coming to a close. In early October we applied for a $25,000 grant. 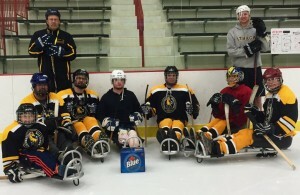 LaBatt USA partnered with USA Hockey to award 10 new sled hockey programs in the United States a grant for new equipment, uniforms, program costs, and ice time. On November 5th, the Mustangs were notified that they were selected as one of the winners. Volunteers give most non-profit organizations the energy and passion that it takes to succeed, and we have some of the best. Without our volunteers we wouldn’t exist. Our volunteers are dedicated, reliable, motivated, and most importantly, passionate. Not only do our volunteers help us operate, but they also give us the energy and encouragement needed to keep pushing forward. Thank you to everyone who helps, it is your passion and dedication that gives this team life. A growing program needs some help from outside the organization along the way. We have been fortunate to get the support from local news stations (and we were even able to steal an anchor as an assistant coach). KTTC’s Chris Barriere helped us gain traction within the first few months of our program’s start. He did a wonderful job of capturing our first practice, and what it meant to the players to have an opportunity to try a new sport. Chris is now a regular on-ice helper. 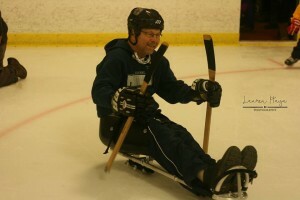 His original story can be found here: http://www.kttc.com/story/29628510/sled-hockey-continues-to-grow-in-rochester. Even though they are competing stations, we thank both of them for helping us show the community who the Mustangs are. And finally we would like to thank our players. Every one of our players has different circumstances that led them to sled hockey. It can be scary starting a new sport, especially with the added complexity of medical issues. Hockey can be an intimidating sport, for anyone, but every Sunday our players show up. They encourage one another, they push one another, and even though they all have different ailments, they have bonded over the common goal of improving their game. The Mustangs thank everyone who has helped our program grow in our first full year, including those who have shown their support on Facebook and Twitter. I would like to personally thank everyone involved with the Mustangs program. The best gift I received this year was the opportunity to play hockey. Becoming involved with the Mustangs has given me far more than I expected. I have met new friends and great people, and I have an appropriate focus for my competitive fire again. Justin McClanahan is a Public Relations major at Winona State University. Justin is a player and board member for the Rochester Mustangs. Dr. Michael Stuart founded the Rochester Mustangs because of his love for hockey and his interest in providing an opportunity for everyone the chance to play. “We live in the State of Hockey, and we are excited about the opportunity for athletes of all ages and abilities to try this great sport,” said Dr. Stuart. 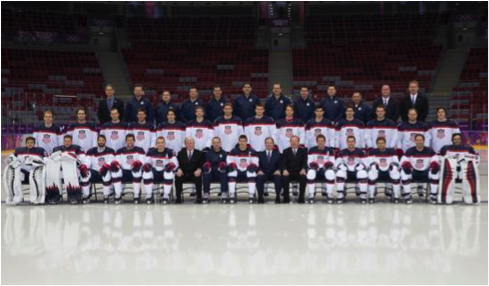 Dr. Stuart worked as the team physician for the U.S. Olympic Men’s Ice Hockey team that captured the silver medal in the 2010 Vancouver Olympics. 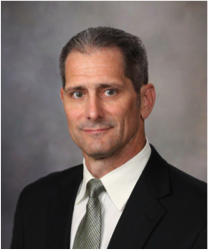 Dr. Stuart was also the team physician for the 2014 Olympic games in Sochi. “Growing up I played a lot of team sports before my injury, like baseball, basketball, football, and track,” said Rob Weigel, a T11 paraplegic. “Since my injury, I got in to some cycling and other things, but they just didn’t have the same aspects as a team sport. 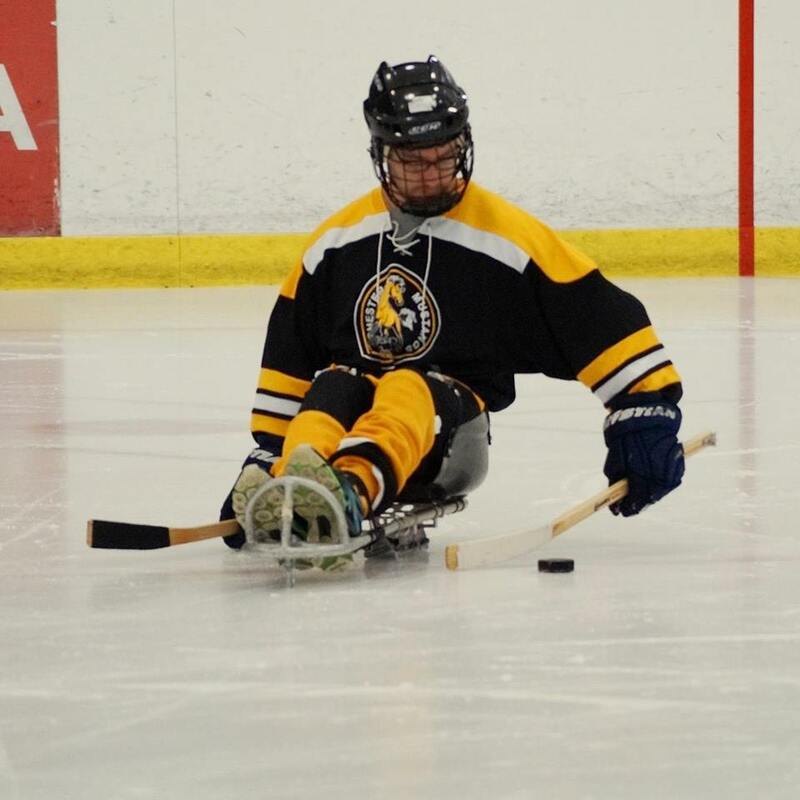 Team sports have comradery, and the Rochester Mustangs sled hockey team has given me the chance to get that back,” Weigel said. The Mustangs currently have 10 players on roster. Like you, each player has a unique life story to tell. However different the circumstances that led them to sled hockey are, the sport has united them. Even though the Mustangs have only held 5 practices, the growing competition and sportsmanship between players each week is something you have to experience. Players started out unsure and hesitant, but now push each other to go harder each practice. If you think helping the team is something you would like to do, come watch a practice at Graham Arena on Sundays at either 8:45 a.m., or 10 a.m.(Check schedule here: Calendar). We are looking for volunteers with varying skills to lend a hand. Be careful, once you witness the enthusiasm and positive vibe exuded by volunteers and players at practice, you’ll be hooked. You can help us succeed. Rochester is a hockey community, and we need the vast network to help our program become part of the family. You can share our story, volunteer to help with practices, tell someone who you think would want to play, join the conversation, share our story on social media, or just come watch a practice. Dennis P. Kimbro said, “Life is 10 percent what happens to us and 90 percent how we react to it.” Whether you choose to enrich your life through volunteering, or are a person who chooses to not be defined by disability, the Rochester Mustangs could use your support. In 1988, a small boy bit his tongue and started bleeding while traveling the country with his family. Five days passed and the boy still bled, and his parents grew concerned. When his parents took him to the hospital, the doctors found nothing wrong and released him. Months later, when the boy’s knee doubled in size after a fall, he was diagnosed with severe Hemophilia, a rare genetic bleeding disorder. As you may suspect, I was the little boy. Hemophilia affects my blood’s ability to clot without medical intervention. My main concerns center around internal and external bleeding. Unfortunately for my parents, I was a wild and active child. I enjoyed playing football, baseball, basketball, and roughhousing with my friends. Because I was so active, I experienced a frequent amount of internal bleeds (a pooling of blood in joints and muscles). Have you or someone you know ever been forced to quit something? The frustration that results can put you in a bad place. I was forced to quit organized sports when I was 12, leaving a competitive fire burning inside me without release for 17 years. All of those years I felt like a part of me was missing, until I became a Rochester Mustang. 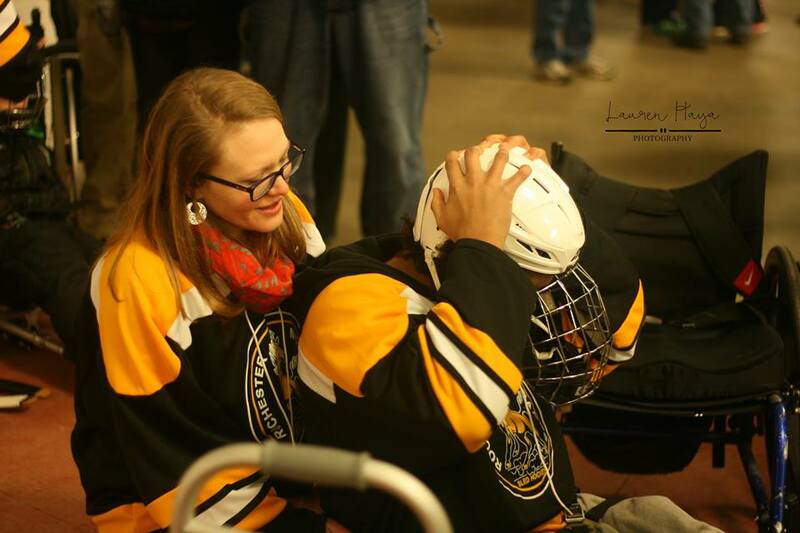 My endless desire for sport and competition led me to the Rochester Mustangs sled hockey program. 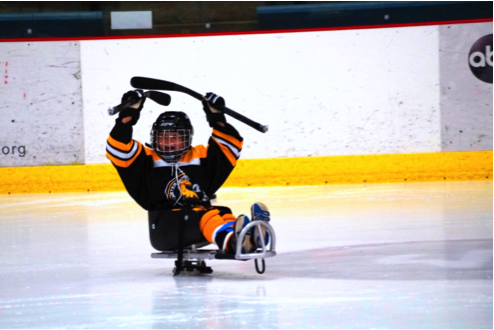 Sled hockey provides a chance for those with a physical disability to enjoy the sport of hockey. I didn’t know it at the time I joined, but becoming a Mustang res tored a part of me that had been missing since I was 12, I was part of a competitive team again. The best part about being a Mustang is that when the team is on the ice, everyone’s disability disappears. Whether you have a chronic illness, are an amputee, or have a spinal cord injury, everyone is on the same level. When the Mustangs skate, it is about working together to become a better team. You may be, or know of, someone suffering from a disability, without a proper outlet for a sport. 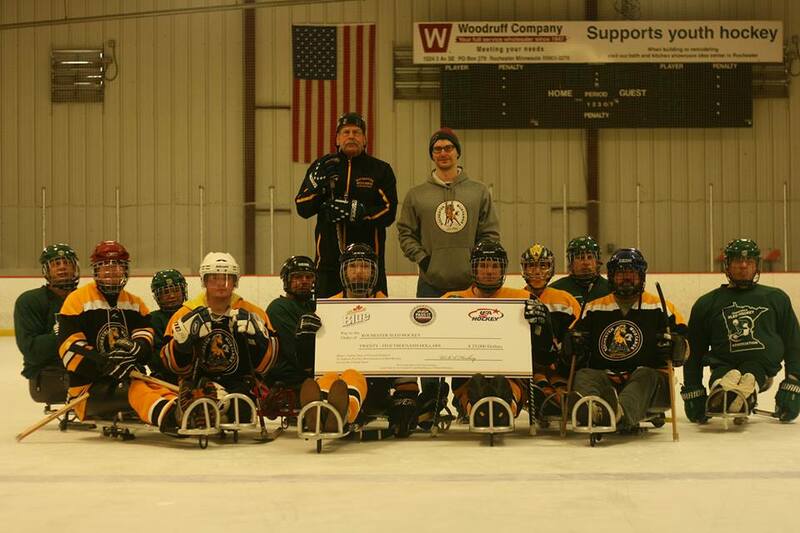 The Rochester Mustangs are looking to grow the sled hockey program. Share your story with us. 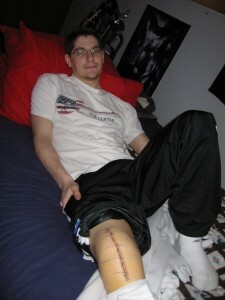 Have you experienced injuries that forced you to give up something? Do you know of someone who would benefit from joining our team? 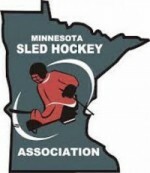 Or do you have any questions about what sled hockey is or what the requirements are? Leave your comments and thoughts below or message us privately for more information. Check us out in the news!! If you have never had the chance to experience a sled (or sledge) hockey game, then you are missing out! 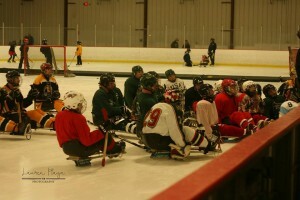 Sled hockey is very similar to regular hockey, but the teams play sitting down on sleds. They propel themselves around the ice with small hockey sticks with ice picks on the bottom of them. This sport is primarily played by those individuals that have some sort of physical disability (like Spina Bifida, Cerebral Palsy, etc). Teams play using standard hockey rules and full checking is allowed. Sled hockey is truly an inspirational sport to watch. In the past, most disabled children and adults did not get to experience a true competitive sport environment. Over the years, though, there have been many advancements to help the disabled become more active and competitive. Sled hockey, like wheelchair basketball, has really started to catch on! Every four years, there is a disabled Olympics that are played in the same city as the regular Olympics. In the 2010 Winter Olympics, the USA Sled Hockey team won the gold medal beating teams from all over the world. As these sports continue to grow, so do the opportunities that come with them. USA Hockey, like with able-bodied hockey, is the parent organization. Around 2005, they started a yearly disability festival that is held in various locations around the country each spring. This festival gives all sled hockey players from around the country an opportunity to play and compete on a higher level. It also gives them a chance to meet others that face similar challenges. Gene Hart is a sports fanatic and follows all aspects of hockey.